So, now we know just what the EU commission had up its sleeve. A bigger stimulus package than many had been predicting, totalling 200 billion euros (£168.4bn) or 1.5% of the total output of the EU economy. But just because that is what is proposed, it's not certain to actually happen. The EU commission now has to persuade its 27 members to start pumping the money into their own economies. Of the 200 billion euro figure, the EU will only be putting in 30 billion while 170 billion must come from individual nations' own budgets. Many, like the UK and Germany, will argue they have already done their bit with initiatives announced in the past few weeks. Poland meanwhile is making reluctant noises about the advisability of the scheme, pointing out that it will involve large scale borrowing at a time when credit markets are very tight. No one will be surprised if other disharmonious voices are raised in the next few weeks as the focus shifts to an EU summit on the 11 December where leaders from all the member states will hammer out the final form of the recovery plan. If the plan emerges looking similar to how it was presented today, Commission officials will not only be very happy, but also a little surprised. The argument in favour of all acting together is that a boost in one country leads to a so called "positive overspill". In other words, all that extra cash intended to pay for building projects, research into greener cars and tax cuts eventually ends up crossing borders and helping neighbouring countries. It sounds plausible. But it s worth noting the discrepancies between different member states. Poland and Slovakia for instance are growing strongly, but look at Ireland or Germany and the picture is quite grim. So can "positive overspill" really work when there are such imbalances? Won't some states have to take on a greater burden than others? For the plan to work, some governments may find they come under pressure to contribute more to help those that are suffering. 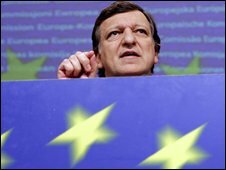 But at the beginning of Wednesday's press conference Mr Barroso set out his stall. He attacked what he described as the "glamour of pessimism", and made clear he believed that a deep and painful recession can be avoided. For him the EU plan fits into a growing consensus that in order to weather the financial storm, countries must spend their way out of trouble. The thinking comes from the hard lessons of the great depression. 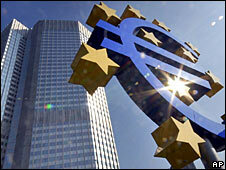 But Mr Barroso also mentioned the seventies, when huge debts and high inflation crippled many economies. Whether the lessons of that era have been learned is yet to be seen.